Recently a friend told me, “My husband has never been to a Disney theme park. He hates waiting in lines.” While it’s true that a Disney theme park vacation can mean time spent in a queue, there are ways to greatly minimize your wait time. Utilize FastPass Plus at Disney World. A “Fastpass” is a reservation for a ride or other attraction. This is included with Disney World admission. FastPass Plus reservations are completely electronic and can be booked from your My Disney Experience (MDE) account, which can be set up on your computer, smartphone, or tablet using the Disney Parks website or MDE app. 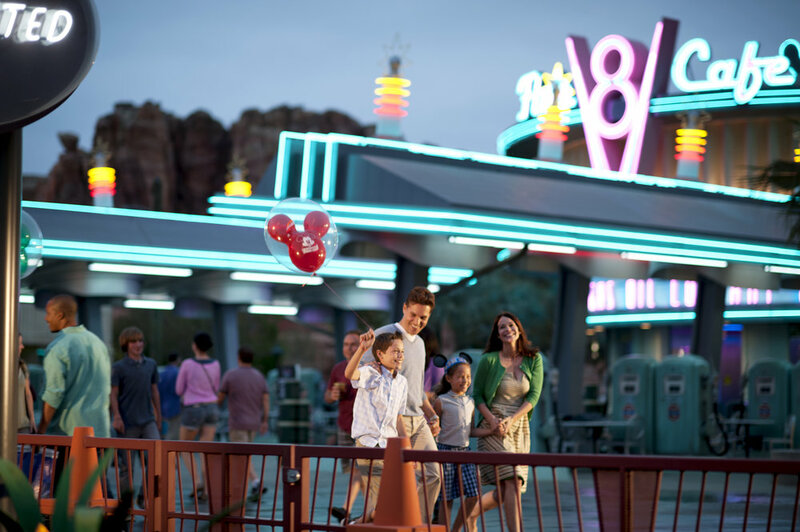 For guests staying on property at a Disney hotel, FastPasses can be booked 60 days in advance. Guests staying off-property can make their reservations 30 days in advance. Know when your booking window will open. Guests are able to book starting at 7 a.m. eastern time, so be at your computer ready to go! Have your My Disney Experience account set up and linked to your tickets and to the MDE accounts of any friends or family that you’re traveling with. If you aren’t able to get a FastPass that you want, check back periodically, even up to the night before you’re at the park. People are always changing their plans, and you never know when a Flight of Passage FastPass will pop up! Don’t schedule FastPasses for the first hour or so that the park is open. Lines will be short, so you really don’t need FastPasses then. Check wait times on the My Disney Experience app. Check attraction wait times in the weeks before you book so that you know which rides are the most popular. Don’t waste a FastPass on an attraction that is unlikely to have a line. The app can also be used to modify or add FastPasses. Book a club level room at a Disney resort. This gives guests the option to purchase three extra FastPasses for $50 per person per day. These can be booked 90 days out and can be for any park. The early FastPass booking window almost guarantees access to the most popular attractions. Purchase the MaxPass add-on to your park admission. These parks utilize the original FastPass format, allowing guests to get paper FastPasses in the parks by inserting their park ticket in a kiosk next to the attraction. A ticket is then printed with a return time. But for an extra $15 per person per day, guests can schedule the FastPasses using the park app, without having to traverse the park to get to the kiosks. The MaxPass also includes unlimited downloads from Disney PhotoPass. Arrive at the park early. To really get an advantage, plan to get to the park 30 to 45 minutes before it opens. You can go through security and be at the front of the pack well before “rope drop” occurs. Plan to head to the most popular rides first thing while the lines are at their shortest. Stay at a Disney resort. Resort guests at Disneyland and Disney World are allowed entry into the parks at special times. Early Magic Hour means shorter lines for those vacationing at Disney hotels. At Disneyland, any guest purchasing tickets for three or more days has access to designated Magic Mornings. Hire a VIP tour guide. Guests wanting some special attention and perks can hire a VIP Disney guide for up to ten guests. The guide can focus on what the group is most interested in, and guests are able to access the FastPass line for any attraction. Guides are also well-versed in Disney park history and trivia, and this can make the experience even more enjoyable. This access doesn’t come cheap – the cost is $400 to $600 an hour for a minimum of six hours a day. Vacations by Shannon can assist in making park itineraries that take into account predicted crowd levels and patterns in order to minimize lines and maximize your group or family’s time in the parks. Message Vacations by Shannon for FREE Disney travel planning.